This page summarizes ATAI’s policy bulletin on the impact of information delivery approaches on farmers’ productivity. It was written by ATAI staff, and originally published on the J-PAL website at this link. Farmers need many types of information to assess new technologies and make optimal management decisions. However, shaping behaviors is difficult and traditional extension has not consistently convinced farmers to change their production practices. In particular, extension services and training programs do not always reach farmers with the right information at the right time. Inappropriate or ineffective information delivery may constrain a farmer’s ability to assess a new technology, ultimately dampening yields and profits. 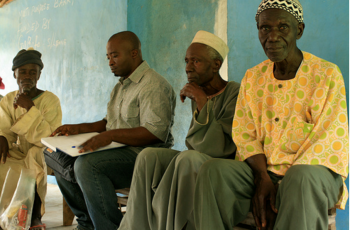 Agricultural extension is the most common program model used to transmit information to farmers in developing countries, and it is often one of national agriculture ministries’ primary programs. 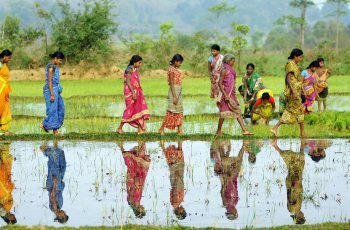 Traditional government agricultural extension programs—for example, top-down approaches like training and visit—often focus on extending commonplace agriculture practices. Bottom up approaches—for example farmer field schools—often focus on helping farmers adopt newer, more sustainable practices. But both have seen low use by farmers in many settings  . 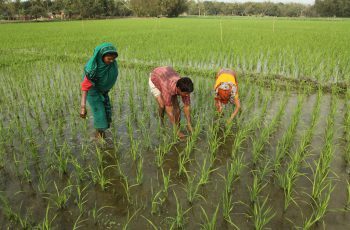 Results from 12 randomized evaluations of delivering agronomic information to farmers in developing countries point to several key elements of extension programs that influence farmers’ decisions to take up and use new inputs and practices. Approaches like using technology to reach farmers directly with timely and tailoredinformation, incentivizing trainers, and leveraging social networks to increase diffusion of information have all been effective ways to increase the impact of agricultural extension programs. Traditional extension services may have low use in part because they focus on maximizing yields rather than maximizing farmers’ profits.For example, the Kenyan Ministry of Agriculture based recommended fertilizer amounts on maximizing yields, which may serve broader food security goals, whereas the optimal amount from the farmers’ perspective to maximize profit was much lower . In Bali, seaweed farmers used the optimal amount and spacing of seaweed. Adopting the recommendations of a local NGO-run extension program would have reduced farmer profits (but increased yields) . Information and communications technologies can improve on traditional extension by tailoring recommendations to farmers’ needs at relevant times during the agricultural cycle. Traditional extension models rely on in-person visits with standard training messages for a small number of farmers. These trainings are often infrequent, meaning the training message may be irrelevant to farmers at that point in the growing cycle. Tailoring information at particular points of time in the planting season can increase the effectiveness of extension programs. 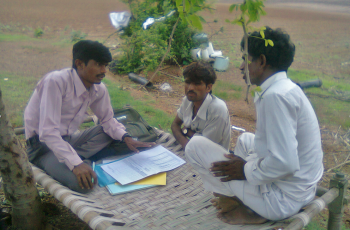 In Odisha, India, an interactive voice response system, Avaaj Otalo, provided timely information on weather and inputs and specifically answered farmers’ questions about practices. A randomized evaluation found that farmers with access to the mobile extension service increased cumin yields by 28 percent and cotton yields by 8.6 percent . 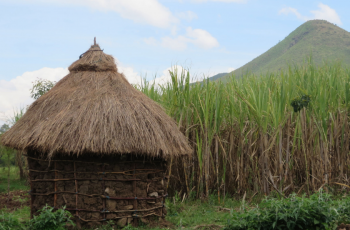 In Kenya, a hotline allowing farmers to report problems to a large contract farming company reduced the likelihood of delayed fertilizer delivery by 22 percent. In one evaluation, SMS messages to farmers with agricultural advice increased yields by 11.5 percent. However, in a second evaluation, the impacts were less certain. Yield increases were smaller overall and too varied across farmers to be able to conclude whether the SMS messaging had any impact or whether the SMS messaging would have a high-benefit cost ratio. . Farmers respond differently to the same message depending on who delivers it. Most extension services will not reach all farmers directly and instead depend on social learning to disseminate information. Farmers may be more likely to follow advice from someone they consider similar to them , or in some settings more likely to listen to information delivered by men . Farmers may need to see a new technology demonstrated by several people in their network to adopt the practice themselves . Selecting the messenger more systematically could increase the spread of new technologies and practices. 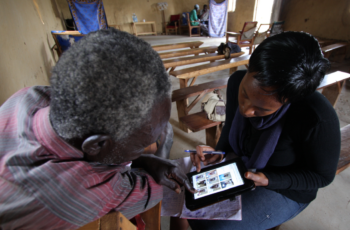 Trainers are more likely to improve technology adoption among farmers in their programs when incentivized. Trainers’ incentives are not always aligned with outcomes for their trainees, and in several settings, better aligning those incentives improved adoption of improved technologies. Giving farmers a mechanism to provide feedback on trainings can increase engagement, and incentivizing trainers based on adoption of a new technology can help improve learning . Suri, Tavneet and Rachel Glennerster. 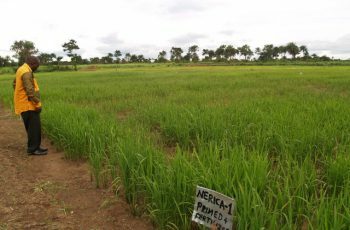 “Agricultural Technology and Nutrition: The Impacts of NERICA Rice in Sierra Leone.” Working Paper, March 2015. Tjernström, Emilia. “Learning from Others in Heterogeneous Environments” Working paper, Agricultural Technology Adoption Initiative, April 2017.